Last traces of mesa-top snow melted in early March. La Sal Mountains 35 miles distant will retain their snowy caps into June. Desert landscapes benefit from having contrast; Utah’s beauty is at its peak in the seasons where red is tempered by something else. In springtime, small flower blossoms accomplish that. Autumn brings golden cottonwoods, lighting riparian zones afire. Winter, however, earns the prize: white snow breaking up vast expanses of sandstone, looking for all the world like a layer of frosting on sedimentary cake. Winter also reveals easy-to-read clues of wildlife activity. Tracks are far simpler to follow and identify in fresh snow, leaving my mind to imagine what that scurry was all about, or who ate whom, or who lives where. This winter’s long stretch of bitter cold (continuous weeks below zero — an anomaly for southern Utah) left a new sensation underfoot when I returned. Our soil was broken up and fluffed by frost action, and it felt as if I were walking on sifted flour instead of packed desert sand. Do consider visiting your national parks in the off season. It has become my favorite time to explore new places. 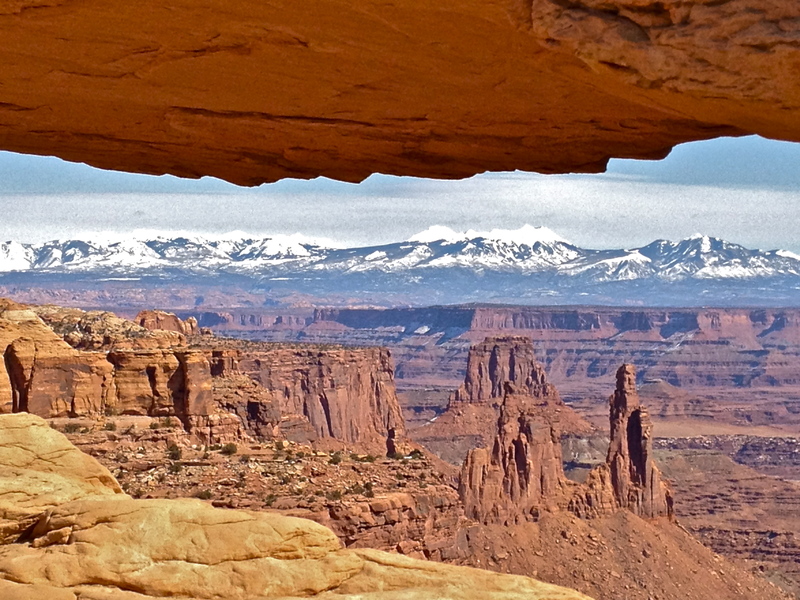 Snow-capped La Sal Mountains and Washer Woman Arch; Canyonlands NP. I was alive for decades before I began to understand and name my own personal sources of refreshment and refueling. With joy I report: life has taken me to a place where I daily experience them in feast-ish proportions. When I am roving the trails on ranger duty, standing on the edge of canyons a couple thousand feet deep, staring at ragged mountains jutting two a a half miles above sea level, breathing in great lungfuls of silence, that ‘secret nerve’ is fully activated. At times it seems that my heart can barely survive the reverberations. What stirs YOUR secret nerve? What fills you, satisfies you, nourishes your soul? I’d like to know. 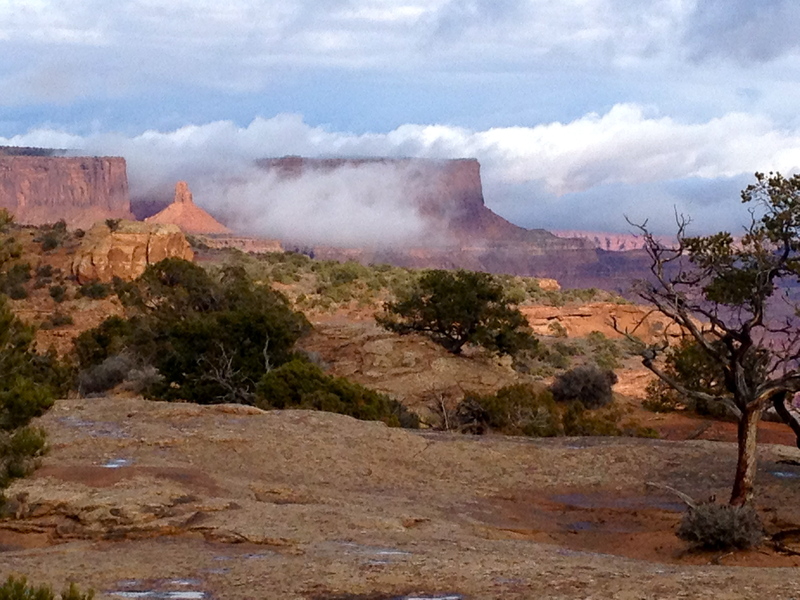 Clouds linger in the canyons after winter’s last gasp at Island in the Sky district..
Spring is marching forth with unbridled energy as I return to Utah to begin my fifth season as a ranger in Canyonlands National Park. Winter’s remains are draped over the land; pockets of snow cower on the north sides of blackbrush and juniper, knowing their demise is imminent. The strengthening desert sun leaves no option. Driving up and over the high knoll which conceals the massive sandstone chasms, knowing what spectacular view lies just ahead, I inhale deeply… but nothing in all the earth prepares me for the beauty that unfolds southward. Joy, joy — I am back where I belong.